To win this game players must be the kindest and most generous of the bunch. Remember when you helped your friend move? Or when you fed your parents cat for a week? In real life, generosity doesn't always get you ahead. But in this game, it'll make you a winner. To play, choose a card from the deck. Each has a different thoughtful act like—"I washed your car," "I wrote you a song"—and a score. Whoever has the higher score takes both cards and so on until the deck is finished. The person with the highest score (and biggest heart) wins. 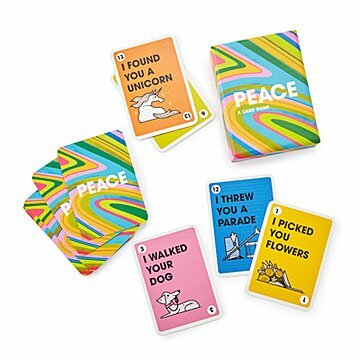 A fun alternative to most classic competitions, the cards bring a bit of compassion to family night. Made in China.